Statue of Neptune in the Long Market (Długi Targ) in Gdańsk's Old Town at night. 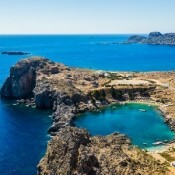 An aerial view of St Paul's Bay, near the town of Lindos on the eastern coast of the Greek island of Rhodes. 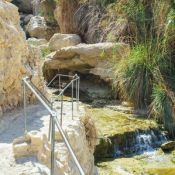 The David Falls at the Ein Gedi oasis in Israel, near the Dead Sea.